ALL I WANT FOR CHRISTMAS...is a cure for Diabetes! The holiday season is almost upon us. It’s a time for giving – to our family, to our friends, and maybe the time to think about those charities and good causes we’re too busy for during the year. Maybe this is the year you’ll think about supporting Diabetes research. The fight is nowhere near over. And there’s a painless way you can help to make a difference. Read. That’s right. Read. All I Want For Christmas is a set of 15 Christmas-themed novellas by some of today’s leading voices in romance. And all the proceeds – yes, all the proceeds – go to Diabetes research. So why not get in the holiday spirit, spoil yourself with some good reads and a good deed? 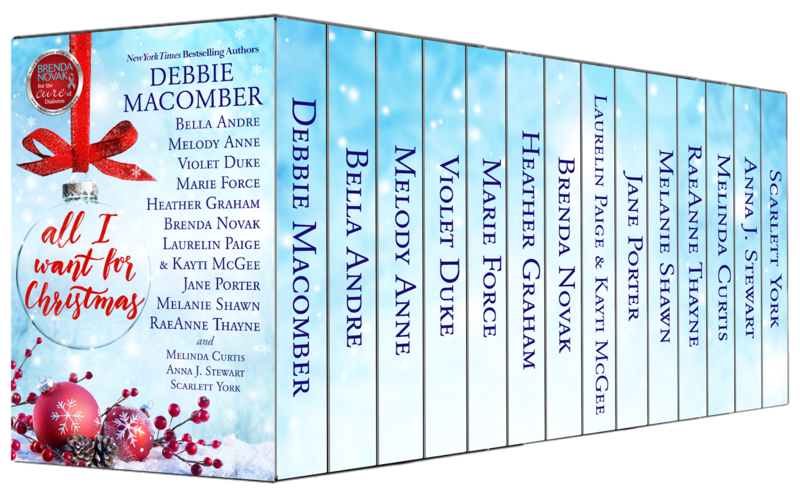 NYTimes Bestselling authors Debbie Macomber, Bella Andre, Melody Anne, Violet Duke, Marie Force, Brenda Novak, Laurelin Paige & Kayti McGee, Jane Porter, Melanie Shawn and RaeAnne Thayne. Also included, USA Today bestselling authors Melinda Curtis (that’s me! ), Anna J. Stewart, and Scarlett York. Wonderful collection of books by top authors. Congrats on donating ALL the proceeds for aiabetes research. My Dad had diabetes, so this cause is near and dear to my heart. Thanks so much for sharing. We have friends whose daughter has type 1 diabetes, and my second cousin's girl has it also.